The bricks shall be of standard shape, burnt red, hand formed or machine made and shall have a minimum crushing strength of 1000 psi. Cement-sand mixes of 1:6 and 1:4 shall be adopted for 1 brick and half brick thick walls respectively. The addition of small quantities of freshly hydrated lime to the mortal in a lime-cement ratio of 1/4:1 to 1/2:1 will increase its plasticity greatly without reducing its strength . 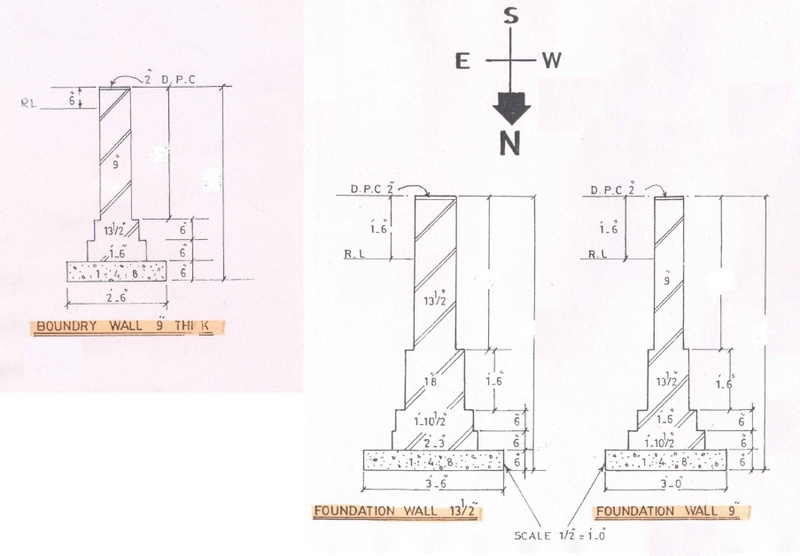 Where steel reinforcing bars are provided, the bars shall be embedded in a cement-sand mortar not leaner than 1:4 or in a cement concrete mix of 1:2:4. All plasters shall have a cement-sand mix not leaner than 1:6 on outside or inside faces. It shall have a minimum 28 days cube crushing strength of 500 psi. A minimum plaster thickness of 3/8'' shall be adopted. The concrete used in various seismic bands shall have a minimum compressive cylinder strenght of 2500 of psi at 28 days. The reinforcing steel will have a yield strength of 40,000 psi. Horizintal reinforcement of walls is required in order to tie orthogonal walls together. 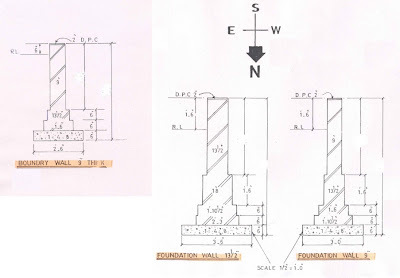 The most important horizintal reinforcement is by means of reinforced concrete bands provided continuously through all load-bearing longitudinal and transverse walls at plinth, lintel and roof-eave levels and also at the top of gables according to the requirements stated below. This should be provided at plinth level and may also serve as damp-proof course. The plinth level shall not be more than two feet high above surrounding ground level. A lintal band shall be incorporated above all openings and shall be continuous in all interior and exterior walls. The reinforcement over the openings shall be provided in addition to that of any other requirement. The lintel level of all the doors and windows shall be at the same level to facilitate of this band all around and inside the building without any discontinuity. This band shall be provided at the eave-level of trussed roofs and also below gable levels on such floors which consist of joists and covering elements so as to integrate them properly at their ends and and fix them into the walls. This band is not required in case of reinforced concrete or reinforced brick masonry slabs. Masonry gable ends must have the triangular portion of masonry enclosed in a band, the horizontal part of which will be continuous with the eave-level band on the adjacent longitudinal walls. The width of the RC bands shall be the same as the thickness of the wall. The minimum thickness of a load-bearing wall shall be 9 inches. A cover of 1 inch from the face of wall shall be maintained for all steel reinforcing. The vertical thickness of the RC bands may be kept to a minimum of 6 inches with 4-1/2 " θ bars as reinforcement for economical reasons a minimum thicknessof 3 inches with 2-1/2θ "bars may be adopted. The concrete mix shall be 1:2:4 by volume. Alternatively, it shall have a minimum compressive cylinder strength of 2500 psi at 28 days. The longitudinal bars shall be held in position by steel stirrups 3/8"θ placed 6" center to center. Steel bars shell be installed at the critical sections (i.e. the corners of walls, junctions of walls and jambs of doors) right from the foundation concrete in cavities made around them during the masonry construction. The concrete mix should be kept to 1:2:4 by volume, or richer.